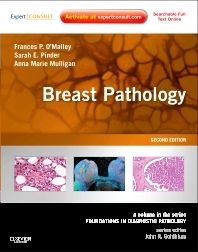 Breast Pathology, a title in the Foundations in Diagnostic Pathology series, provides all of the most essential information on the pathological entities encountered in practice in an easy-to-use format. Drs. Frances P. O'Malley, Sarah E. Pinder, and Anna Marie Mulligan provide unparalleled expert guidance for the study and diagnosis of a broad spectrum of breast lesions as well as the broad range of appearances of normal breast tissue. The consistent, practical format with a wealth of illustrations, at-a-glance boxes, and tables, make this title ideal for quick reference for both novices and experienced breast pathologists. Examine all aspects of a pathologic entity, including clinical features, pathologic features (gross and microscopic), ancillary studies, differential diagnosis, and prognostic and therapeutic considerations. Catch all the nuances of how pathological lesions present through over 400 full-color illustrations. Practice with confidence and overcome your toughest challenges with advice from the top minds in breast pathology.